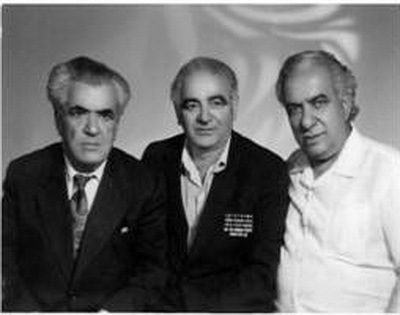 Dr. Kachatryan (right), Josef Kogan (middle). In a moving ceremony that took place at the Presidencial Palace in Yerevan, Armenia, the International Raoul Wallenberg Foundation (IRWF) bestowed the Raoul Wallenberg Centennial Medal to Armenian Holocaust Rescuer, Dr. Harutyun Khachatryan. The medal was presented to Anna Khachatrian, on behalf of her grandfather, by Baruch Tenembaum, founder of the IRWF and Artiom Chernamoryan, a prominent IRWF volunteer. “For the last two years, our organization is led by my good friend, Mr Eduardo Eurnekian, a prominent Argentinean entrepreneur of Armenian descent. We feel blessed to have him on board because he has instilled in us what I would define as “the Armenian spirit”. A combination of the highest values of human solidarity and relentless initiative, which are so typical to the Armenian people.” said Tenembaum. “The Wallenberg Foundation will continue its relentless work with the aim of discovering the awe-inspiring stories of more Armenian rescuers. We are honored and proud to bestow the Raoul Wallenberg Centennial Medal to President Sergh Sargsyan, who as head of state of the Republic of Armenia stands here representing all the Armenian heroes those who were already recognized, and those who are still anonymous.”, said Danny Rainer, IRWF Vicepresident. Harutyun Kachatryan was born on April 5, 1915 in Karakhan-Beklu village of Nakhidjevan. He moved to Yerevan in 1934 and pursued his medical studies a the Yerevan State Medical Institute. He joined the Soviet Army as a physician in 1939. In August 1941 he was captured by the Nazis and taken prisoner near the city of Velikie Luki. In this prisoner camp, serving as a physician he met and treated a wounded Jewish inmate, Josef Kogan, saving his life. Khachatryan returned to Armenia in 1946 and worked from 1946-49 as a chief physician at Ashtarak Regional Hospital. He was sentenced to death in 1949, having been accused of betraying his homeland. The sentence was later changed to 25 years in prison. From 1949 to 1956, he served his sentence in in Norilsk, Siberia. He was released in 1956 and restored to his position in 1960. He worked as a doctor at the Yerevan N17 policlinic from 1956 to 1984. In 1983 he had a long-awaited reunion with his military colleagues and friends. A letter that Josef Moses Kogan sent to the State Security Committee of the Union of Soviet Socialist Republics reveals how this Armenian hero, Dr. Harutyun Khachatryan, saved the life of Mr. Kogan. Kogan tells the whole story in this letter describing how many times the Armenians, and Dr. Khachatryan in particular, saved his life. Kogan was captured by the Germans near the city of Velikie Luki at the end of August, 1941, wounded in the right leg and unconsious, and was moved to the concentration camp of the same name. Dr. Harutyun Khachatryan treated him and he was able to walk again, but later the Jewish war prisoner became infected with spotted typhus. In spite of quarantine and an order not to communicate with dying patients, Khachatryan continued to visit him, bringing food and medication. The war prisoners were regularly transported to various concentration camps; from Velikie Luki to Polotsk, from Polotsk to Borisovo, from Borisovo to Beniaminovo (Poland). Beniaminovo was not the only place in Poland where there were Soviet war prisoners; they were transported from Beniaminovo to Demblin, from Demblin to Pulavi. For his protection, Dr. Khachatryan had arranged for Josef Kogan to stay with Armenian prisoners and go by the name of Michael Markosyan (Misha Markosyan). However, an unknown person betrayed him to the Commanders of the Borisovo camp. In his book entitled “Missing people,” journalist Michael Hakobyan describes an episode when an Armenian war prisoner (later the Commander of the first Soviet Partisan Detachment of France,) Alexandr Ghazaryan, was called to the headquarters of the Borisovo camp by the Nazis with Markosyan (Kogan) as interpreter. Ghazaryan was interrogated under suspicion that he was a Jew. Then the Armenian was released, followed by Markosyan. Later Kogan wrote in a letter: “In the concentration camp of the city of Pulavi, an unknown person spread rumors about my background and the Germans formed a medical committee to determine my nationality. It seemed inevitable that I would be sentenced to death, but, at the last moment, just before I was to present myself to the Nazi doctors, the only non-German doctor of this Committee managed to get out of the room by risking his life and stopped me in the corridor, and informed me that someone had betrayed me”. 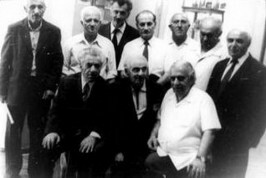 Through the efforts of the Armenian war prisoners who had founded Anti-fascist Underground Patriotic Organization in the Beniaminovo camp in 1942, Kogan was able to hide and the same night his escape was arranged. More than 17 years later, through a letter from Lieutenant Colonel Alexandr Ghazaryan, he found out that again, because of betrayal, the Armenians who had arranged his escape appeared had been held prisoner in the same fascist concentration camp. One of the founding members of the anti-fascist Underground Patriotic Organization, Vahan Vardanyan, described in detail his memories the escape of Kogan: “Before the medical committee, we decided to arrange his escape during one of our organization meetings. We gave him a weapon and bullets. He managed to jump over the wall and run away. The Germans found out everything the next day, most likely through the same informer. Stephan Yaghdjyan was exonerated and we, the ten remaining, were judged as German militaries. We were considered to be Vermacht soldiers. We were sentenced to various years of imprisonment; I have forgotten exactly how many. Karapetyan sentenced to be executed for a supposed connection with the partisans. Doctor Harutyun Khachatryan died on November 23, 1985 at the age of 70. As for Kogan, nothing further is known of him following Khachatryan s death.